I wonder what’s with aspiring astronauts, all of you seem to end up in the language industry; you’re the second one I hear about in the past few weeks (the other one being my friend and colleague Carmen). As for where life can take you: if I’m not mistaken, it’s taken you away from my dear Canary Islands to a number of different destinations recently (yes, I read your blogs 🙂 ). Like I said, it’s a question of seizing opportunities where they arise, and my guess is you are an expert at that! I’m another conference interpreter who wanted to be an astronaut at one point, until I realised I’ve have to study physics and maths! Yeah, that does sort of put a damper on one’s enthusiasm for space travel (although my dad was a physics/math teacher, so it really shouldn’t have been a problem for me 😉 ). Thanks for joining the conversation, Ken! Dziękuję bardzo! I actually tried twice: once during my studies in Canada and then a few years later while living in Germany. The first time around, I was surrounded in class by Polish-Canadians who semed to know all the answers already, so I became discouraged. The second time, I had an excellent teacher and actually learned a thing or two (including the names of the best Polish vodkas ;)). I managed to get to the point where I could get by on the street during visits to Poland. But that was long ago, and life has taken me in other directions since then. Still, every once in a while I wish I’d stuck with it (especially back in 2004, when Poland joined the EU and interpreters with Polish were all the rage 😉 ). I’d encourage anybody reading this who is thinking of learning Polish to go for it – it’s a fascinating language and the country is full of wonderful people. This is a very nice comment Michelle, I am Polish too but it happened to me more than once to think “everything would be so much easier if French or English were my mother tongues” I wanted to do my masters in conference interpreting in Spain precisely at your university or even in Rome but there are no such language combinations…as for the future I was supposed to start my masters next year but my university (paris sorbonne) is sending me to South America next year, this is such a great opportunity, I just cannot say no and I have to postopone my masters in interpreting…anyway what is mean is that we cannot plan anything concerning our future and this definitely is exciting ! May I know how old were you when you started studying the interpreting please ? And was it difficult to get a job? Thanks for your questions. I started my interpreter training in 1999, the year I turned 27. I had been planning to do an MA in conference interpreting since about 1995, but life got in the way ;). In the end, I am very glad I waited the extra few years, for reasons both personal and professional. As it turned out, I passed the SCIC accreditation test just a few weeks after graduation, so I never had trouble with finding work at the beginning. And I was lucky starting out on the private market, as well, as by the time I started working privately in 2004, I was already an AIIC member and had many professional contacts who were happy to hire me. You’ve been doing things the logical way around – finish the education first, then get working. If I do decide to take time out to complete a doctorate, it will be hard. But I’ve been thinking about the idea more and more lately, who knows what will happen. Happy belated birthday, Michelle, and thank you for sharing your past and future goals! Ha ha, love it! There’s much to be said for Alsatian specialties (e.g. kougelhopf) as well ;). Let me know when you make it to Brussels or Strasbourg, we may get lucky and be able to meet up! Great post, Michelle! 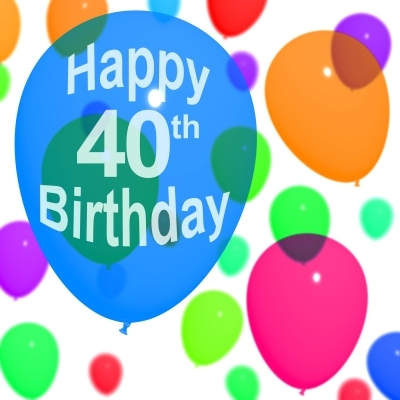 Congratulations on all the great milestones you have reached and conquered by 40! I am also going through the pre-big birthday questions (3-0) and wondering where I will be in 10 years time, still in Brussels, still interpreting? What new languages lie ahead? So many questions! Nice to hear from you, Miren. What languages have you been considering? So many to choose from ;). You know, the DG INTE intranet has a section with interpreter reviews of language schools. You may want to check it out before you decide. Thank you for your kind comments, Diana. I hope your plans come to fruition. One thing is clear to me at 40, and that is that at 30, I was just hardly starting out professionally. Many interpreters I know didn’t start training until well after 30, and far from being a handicap, the extra life experience worked to their advantage. Happy birthday, Michelle! I hope in ten years we’ll still be following your blog, be it on WordPress or elsewhere. And I’m sure in ten years there will be more need of interpreting services, the globalisation will increase the demand for intercultural communication, and nope, there won’t be any Google interpret to take away human jobs. Because one thing that Google will never learn is combining logic and creativity. It can be logical more often than not, it can even be creative from time to time, but there is no way for it to combine these two because there’s no algorithm for doing this. Thank you for your predictions! I hope we’ll have a chance to meet in 10 years and discuss if you were right :). I agree that the complex skills required for interpreting will be hard to replicate by a machine, but the way things are advancing with voice recognition, automatic translation, and related technologies, you never know. Also, it will depend on how client expectations change over time. They may lower to be more in line with what technology can provide (for free?). What do you think will happen with WordPress? Do let us know in a future post 🙂 I don’t think it will go anywhere any time soon! No idea, and I certainly wish the people at WordPress well, but the way things change in the online world, who knows what will be around in ten years. Blogging will probably be considered a quaint, yet outmoded, early 21st-century pastime ;). Happy Birthday, Michelle! I would have never ever imagined that you wanted to be an astronaut! I’m a French young graduate working in a company abroad and planning to focus on my first dream: becoming an interpreter. However, no matter how enthusiastic and confident I am about it (at least, thinking that it is worth trying), my relatives and friends do not feel the same way. Going back to school at 27 seems odd, especially when you have a “secure job” as myself. I’ve been reading you for several months now, and you are definitely bringing me a support whenever I have the blues thinking about my future. I didn’t know about your background, ie, your personal life, and I’m now even more excited about fulfilling my objective. Thanks for your comments, Vincent. I don’t think going back to school at age 27 or later is odd at all! That’s exactly the age I decided to do my MA at. And now, at 40, I’m thinking I might like to go back and do my PhD some day. I actually find older students much more prepared to deal with the training and make the most of it. There may be many arguments against not becoming an interpreter, but “you’re too old” is definitely not one of them, as far as I’m concerned.